The Federal Motor Carrier Safety Administration Regulation §396.11, requires drivers to complete a daily Driver Vehicle Inspection Report for each vehicle operated. SEF, Inc. offers a standard DVIR or we have a customizable solution for you to offer your customers. Our standard form covers the required items in a more or less alphabetized order. 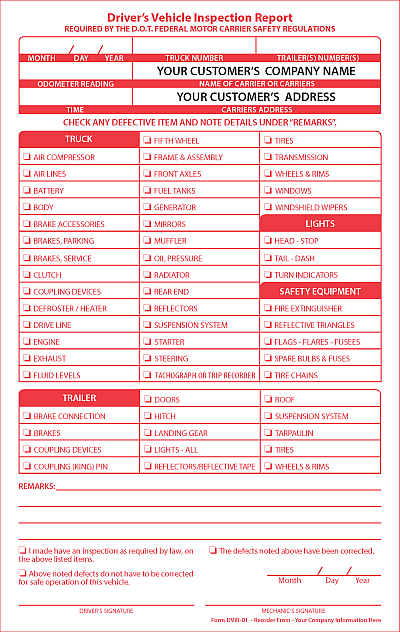 We also have a customizable from that allows your customer to list inspection items in the order that they desire. 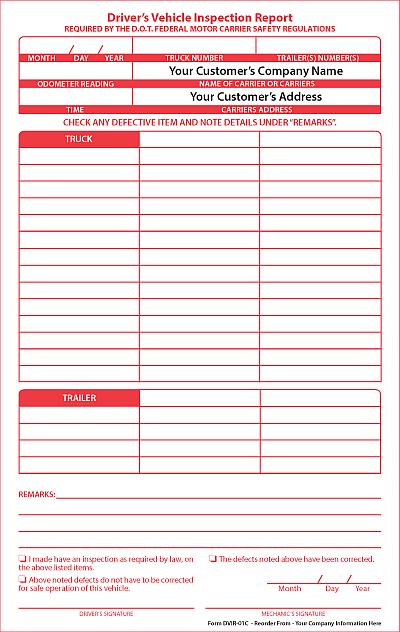 This form is provided as a fillable PDF and can be filled out on a computer or by hand. When it is complete simply return it to SEF, Inc., by email or fax and will typeset and print the form just as your customer has ordered it.